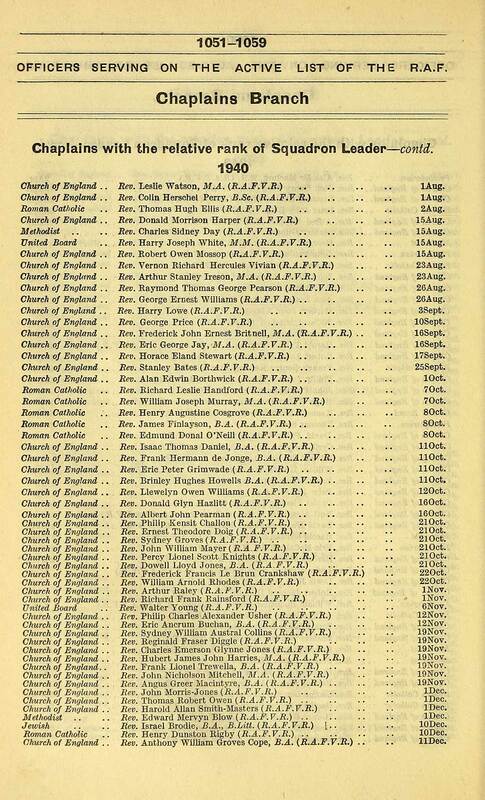 OFFICERS SERVING ON THE ACTIVE LIST OF THE R.A.F. 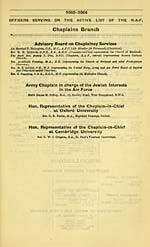 Chaplains with the relative rank of Squadron Leader — contd. Church of England . .
Arthur Stanley Ireson, M.A. (R.A.F.V.R.) . .
George Ernest Williams (R.A.F.V.R.) ..
Eric George Jay, M. A. (R.A.F.V.R.) ..
Horace Eland Stewart (R.A.F.V.R.) ..
Alan Edwin Borthwick (R.A.F.V.R.) ..
James Finlayson, B.A. (R.A.F.V.R.) ..
Edmund Donal O'Neill (R.A.F.V.R.) ..
Eric Peter Grimwade (R.A.F.V.R.) ..
Brinley Hughes Howells B.A. (R.A.F.V.R.) . .
Donald Glyn Hazlitt (R.A.F.V.R.) ..
Albert John Pearman (R.4. F. V.R.) ..
, Philip Kensit Challon (R.A.F.V.R.) ..
. Ernest Theodore Doig (R.A.F.V.R.) ..
John William Maver ( R.A.F.V.R.) ..
Percy Lionel Scott Knights (R.A.F.V.R.) . .
Frank Lionel Trewella, B.A. (R.A.F.V.R.) . .
, Angus Greer Macintvre, B.A. (R.A.F.V.R.) . .
. Thomas Robert Owen (R.A.F.V.R.) ..
, Harold Allan Smith-Masters (R.A.F.V.R.) . .
. Edward Mervyn Blow (R.A.F.V.R.) ..
, Israel Brodie, B.A., B.Litt. (R.A.F.V.R.) [..
. Henry Dunston Rigby (R.A.F.V.R.) 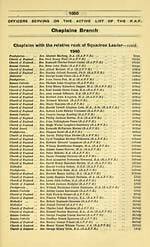 ..
No appointments gazetted after 31st December, 1940, are included in this List. These lists cover 1940 to 1944. From June 1940 to July 1944 air force lists were issued once every two months. These lists cover 1938 to 1945. This series of air force lists runs from January 1931 onwards.